FIXD is the easiest way for drivers to understand and maintain their vehicles. The FIXD sensor plugs directly into your vehicle and connects to the FIXD app. Whenever you have a check engine light or are approaching your next maintenance interval, FIXD will help you better understand what you need to do to take care of your vehicle. Your car is talking – start listening! FIXD helps you understand what you need to know about your vehicle. 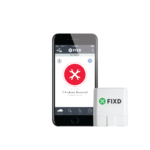 Use FIXD on the go with your smartphone and understand problems your vehicle may be having. You don’t have to be a ‘car person’ to use FIXD – we translate problems into simple terms and give the severity and consequences of continued driving. Monitor multiple vehicles from one account and keep your family’s vehicles safe and maintained. Get notifications on your phone when your vehicle is coming up on its next recommended maintenance interval so you can plan ahead. FIXD uses industry leading safety protocol to make sure your vehicle and your data remains secure. Your data is your data – we don’t sell this information to third parties.